Watering a plant isn’t too hard, there are plenty of moisture sensors on ebay and you can get a small pump easily enough also. The hardest issue is the last one, I wanted to have a good battery life when running on a PP3 to make it viable anywhere in the house, not just near a plug socket, so after searching around on the web, I have included some basic functions to manage power. 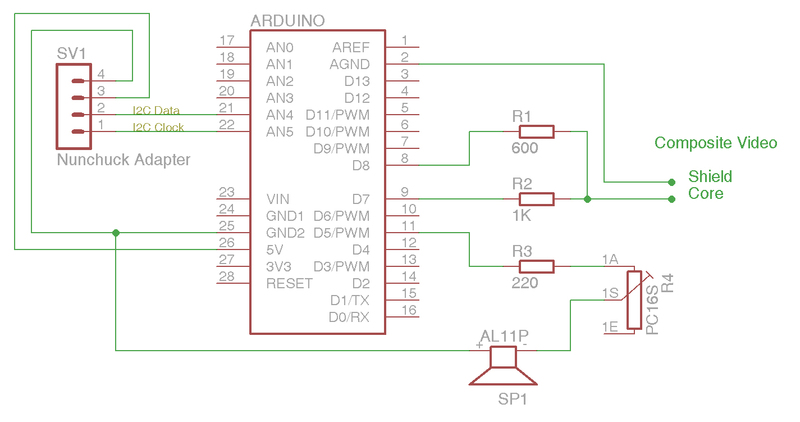 The pump is connected through a L293NE driver chip, just using 1 quarter of the chip as we only need to run forwards – so really just acting as a big power transistor to switch the pump power supply on and off. 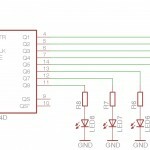 Chip enable – Pin 1 is unconnected – it could be pulled high to be sure to enable the chip but floats there anyway. The motor is connected between 3 (the Y output) and ground. Y output passes whatever voltage is connected to pin 8, when the A input (pin 2) is pulled high. 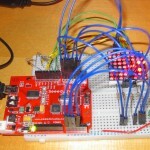 This is connected to Arduino digital output 13 – and so this turns the motor on and off. Piuns 4 and 5 are connected to Gnd always and the chip takes it working supply from pin 16 which is connected to Arduino regulated 5V. 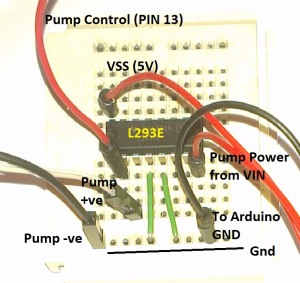 I use the VIN output from the Arduino to get an unregulated supply to the pump – this gives a bit more power. 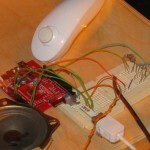 So the upshot of all that is that raising pin 13 on the Arduino truns the pump on and lowering it turns it off. 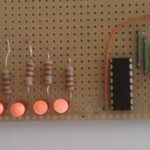 Its been a while since I wrote anything here, but today’s post is how to run a common cathode multi digit seven segment display without extra shift regs or buffers. 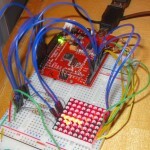 I software multiplex the segments and use the INPUT_PULLUP mode of the digital pins to ensure only one digit is written to at a time. All the docs are in the code. This is pretty cool – I took the TVout library, the Wiichuck library and wrote a 3D library. Put them all together and got a nunchuck controlled 3D shape on TV. 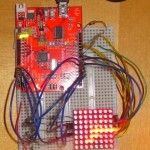 Movement in the nunchuck is detected by the arduino, then the cube is redrawn according to new angle of the controller. At this point I ran out of memory but it wouldn’t be too hard to set up the shapes in FLASH instead of RAM. 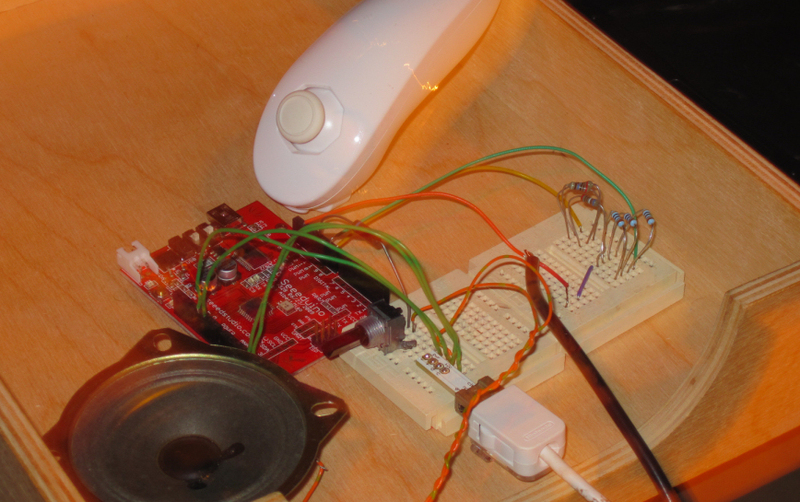 The hardware isn’t too complicated, just a few resistors and a pot for the speaker. This uses exactly the same circuit as the analogue clock. Its running about 100x faster in this video so I can show how it works. Got some POV code working…. Problem is sync – not synched at all, so you can see what it says but it has no idea when to start the sequence relative to the user waving it about. We’ll investigate a switch with a weight on as a synch pulse soon. Here’s some pictures of the board so far. 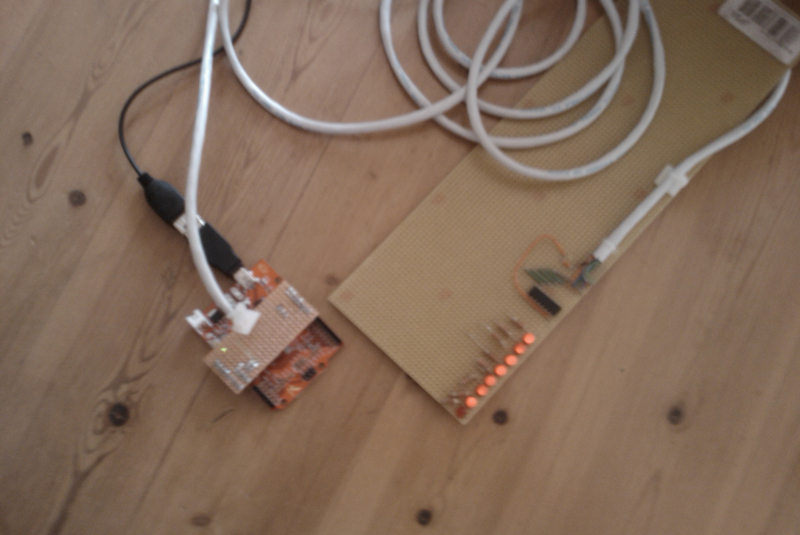 The LEDs are mounted on some strip board and a length of old CAT5 connects it to a small shield board which plugs into the Arduino. The CAT5 supplies power and the three control lines for the shift reg. Its really simple… I wrote a C++ application to generate the alphabet. I’ll post that for download. Then a message is simply an array containing a list of pointers to smaller letter arrays. Each letter array holds a length byte followed by the binary for the letters. Binary is nice because you can tell by looking whether its right. // have we run out of columns for this letter? All the code is in the download area. Doing the synch things seems like it will be fiddly. Might come back to that after a play with TV output. 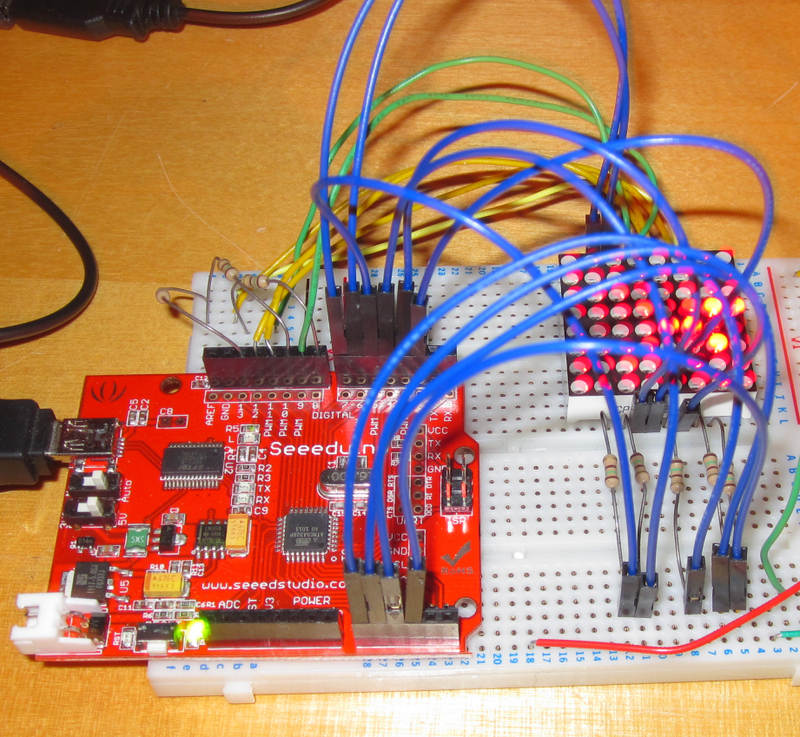 Pretty simple hardware – using the same 8 bit shift register from the thermometer project and driving LEDs from the outputs. The clever bit will be the software – but more about that next time. 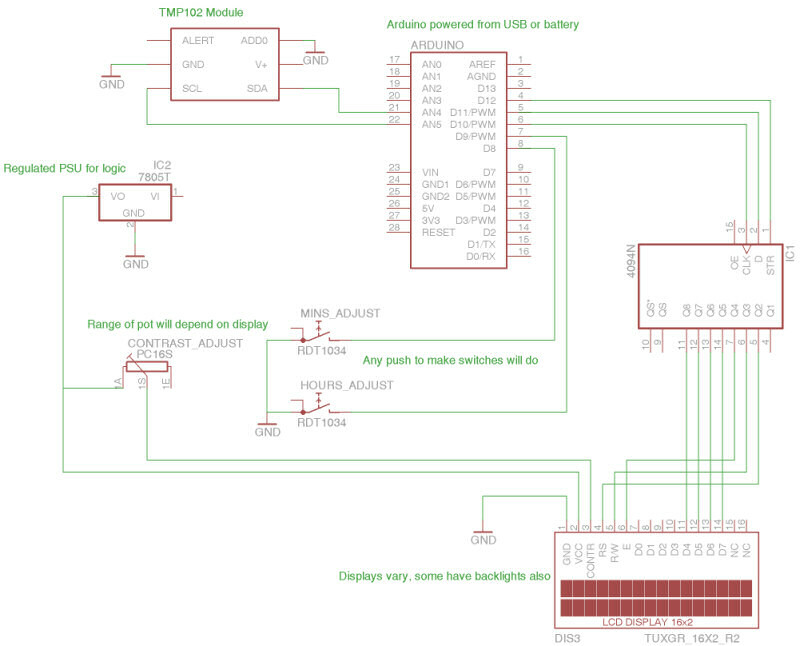 For now, here is the circuit diagram. 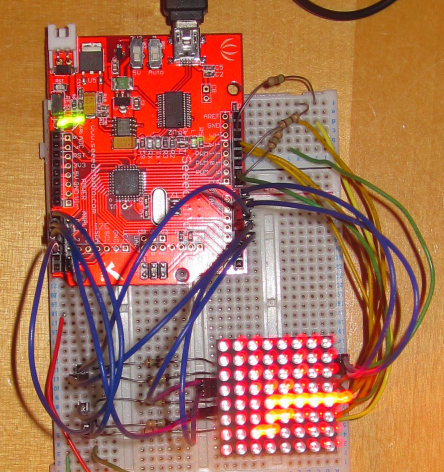 Can’t decide what to do next… Persistence of Vision, Lego Motors, Robot Arms… who knows? So, for our first trick we thought we’d try and conjour up a thermometer, and then we added a clock as well – just for good measure. 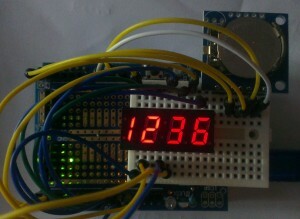 The LCD interface is through 3 wires and a 4094 shift register. 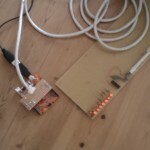 I’ve taken the example 3 wire LCD code from the arduino playground at http://www.arduino.cc/playground/Code/LCD3wires and modified and extended it a little to provide some positioning functions and improve the number drawing code. 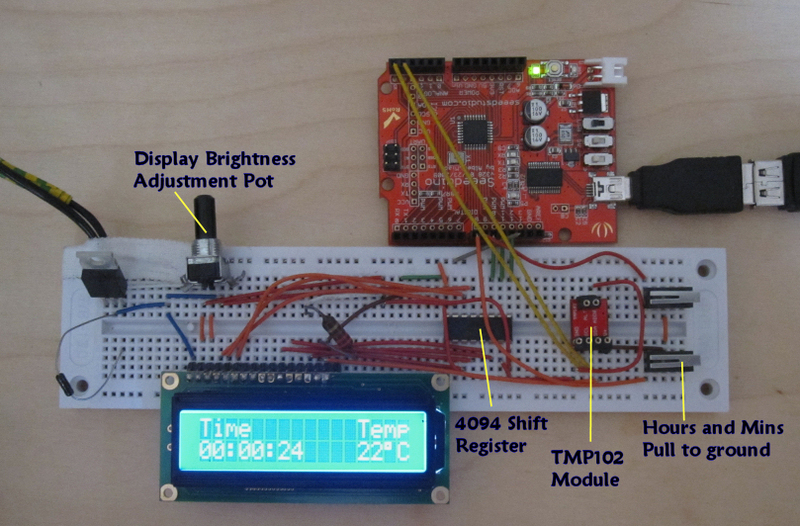 After that all you need to do is just get data for the temperature or the time and then call the display routines. The code for the whole thing is here. A good day to start a blog I think. 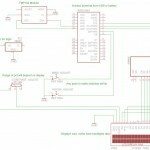 Today I’ll publish my first Arduino project with details of how we put it together.